Read Poetry for a Good Cause! I just received word that one of my poems, “Redemption,” will be included in the anthology titled Not Only The Dark, slated to be published at the end of this year. The anthology is themed on the idea of survival–what it takes, what it costs, and what it’s worth. Should be an interesting read! I can’t believe a little piece I wrote about my dad redeeming glass soda bottles to buy me a coat made it in! Who says real life doesn’t make for a compelling read? The flyer here is for the release party in the UK in December, which I cannot afford to attend due to the fact I am a poor, working stiff. (And a grateful one, I might add!) However, if you’re interested in the anthology, you can use the contact information to order a copy of it for yourself. I believe it is a fairly reasonable £10 plus shipping. 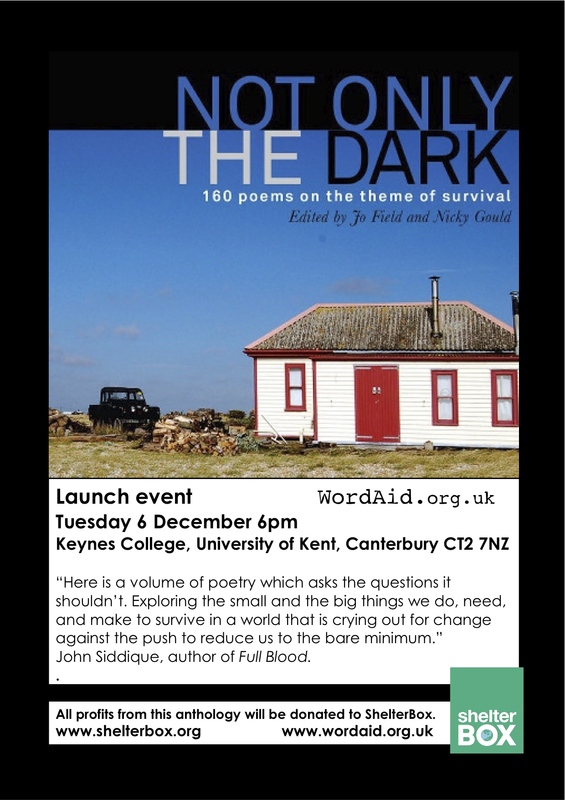 The anthology has been sponsored by WorldAid, and all proceeds will benefit Shelterbox. Both foundations are non-profit and are devoted to aiding those who are struggling around the world. Check out the links here to see what they’re all about! Congrats on your publishing. Will certainly be ordering a copy. I look forward to reason your piece. Thanks! I’m looking forward to seeing it as well! Congratulations! Being published is always a great feeling (and a great achievement). Congratulations! I hope it does well.